I’m still in the process of creating a new Insomnia Pottery website where my pottery blog will live. In the meantime, I am doing my blogging at another website. I just did a post over there about some handbuilt work using Georgie’s Crystal Springs porcelain. It’s been good to work with as long as I don’t rush the drying. 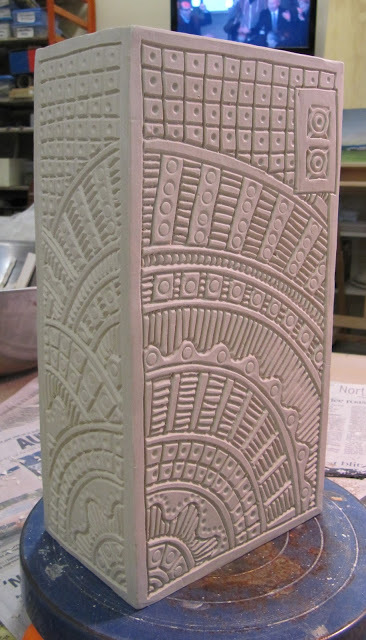 Here’s an image of one of the pots I build and decorate in the blog… please have a look if you are interested. Handbuilt porcelain vase ready for the bisque kiln. I’ll fire this pot in my salt kiln with an interior glaze only. I’ve been getting a lustrous pure white surface with this clay that I really like.